Based on our hunting experience we have gathered these frequently asked questions. If you have any further questions or you think there is some important content missing on this page please contact us and we will provide you with further information and update these dove hunting FAQs accordingly. WHAT IS THE LIMIT ON DOVES PER DAY? There is no limit !! They are considered an agricultural pest. Approximately 25 % of the crops are lost to these birds. In the Cordoba region alone there are over 35 million doves. CAN I BRING DOVES OR PIGEONS BACK HOME? Yes, however going through U.S. Customs with them can be a problem. Sometimes resulting in having to dispose of them prior to re-entering the country. If you still desire to attempt to bring some home, be sure to bring a cooler with you. WHAT HAPPENS TO THE DOVES/PIGEONS I SHOOT? As many as you like will be prepared for you to eat. The rest are given away to the birdboys and local families. They are not wasted. IS ARGENTINA A SAFE PLACE? The government has recently gone through changes in an effort to stabilize the economy. The efforts appear to be working. Throughout the country it is business as usual in Argentina is a Democracy. At no times on my trips have I felt unsafe. However we always take reasonable precautions. We like to keep honest people honest. The value of the Argentina Peso fluctuates. Lately it has been approximately 4 peso’s to one U.S. Dollar. Personal purchases can be made in local stores and paid for with U.S. Dollars. The store keepers will calculate the exchange rate for you. However change will be made to you in peso’s. Credit cards are also taken at many stores. DO I NEED PERMIT OR VISA FOR COMING TO ARGENTINA? In the next link you could check if you need a Visa. Interested parties are hereby advised that Argentina has decided to suspend, as of 1 July of this year, the requirement for payment of a fee to enter the country for tourism or business purposes (as provided for under Decree No. 1654/08 and DNM Provision No. 2761/09) in relation to Australian nationals. Read more. Argentina’sInmigration Authority (Dirección Nacional de Migraciones) has got the electronic travel authorization for Chinese citizen up and running. As consequence of the elimination of the consular visa requirement for Chinese citizens that hold a United States or Schengen visa, Argentina Inmigration Authority -DNM- is implementing the electronic travel authorization (in spanish AVE) for citizen of said country that wish to enter into Argentina. Read more. If you are a Canadian citizen, remember you should pay the Reciprocity fee before entering Argentina since visiting the country for tourism or business, before joining the Argentina must pay the so-called Reciprocity Rate being a requirement of admission to visit the country. The National Immigration Office charges the “Reciprocity Fee” by the Provincial Pagos payment-system through credit card, which is the only way to pay it. How Can I pay the Reciprocity Rates? 1.Register at Provincia Pagos and obtain an entry code. 2.Complete the form including personal and credit card details . This information and the entry code will be sent electronically to the DNM. 3.After payment is processed, print the receipt. 4.Upon arrival in Argentina, go to the DNM Office and present the printed receipt. 5.The receipt will be scanned by DNM staff and the data will be validated to enable entry to Argentina. Do you have any trouble? Check out the Online Payment Instructions. DO I NEED ANY VACCINE? No, fortunately Argentina is an epidemic free country and hunting places are extremely safe. Yes, but don’t worry! We take care of all the paperwork before your arrival. For this reason, we need for you to send us prior to your arrival the hunter’s full name and his passport number. WHAT DO I NEED TO KNOW? AND WHAT HAPPENS IN THE AIRPORT? b) Pay a $600 rate per weapon and for once. In our staff, we have highly qualified interpreters, who will be with you at all times. Absolutely; the hunters will be joined at all times by a professional guide and by the owner (Nacho) who will assist you during your whole journey (airport, hunting fields, lodge, transportation, etc.) They will also join you if you want to go sightseeing, shopping, etc. ARE THERE ANY HUNTING SAFETY RECOMENDATIONS? Never have a loaded gun except when hunting. Always make sure that the barrel and action are clear of obstructions. Always carry your gun so dig you can control the direction of the muzzle, even if you stumble. Always keep the safety on until the gun is brought to shoulder. Always make sure your target is a dove and your backstop is not a hunter or a dog. Never leave guns or ammunition within reach of children or careless adults. Never climb trees or fences with a loaded gun. Never shoot at a flat, hard surface or water. Never drink alcohol or take other mood-altering drugs before or during a hunt. WHAT SHOULD I BRING TO MY TRIP? Shooting Gloves: One or two pair of quality leather shooting gloves. These not only protect your hands from the intense heat of your gun barrel(s) but also save wear and tear due to loading hundreds of cartridges into your gun(s) every day. Hearing Protection: Due to the large amount of shooting you will be doing, quality ear plugs and/or earphone hearing protectors are a MUST. Many hunters opt to wear both earplugs and earphones. Shooting Glasses: Depending upon the weather, you will want the option of clear and tinted lenses. Hunting Clothes: Either camo or natural colors with emphasis on green shades. Comfortable Footwear: Leather boots are best for most conditions. Light Jacket / Rain Poncho: It never hurts to be well prepared. – holding a completed “Autorizacion Temporaria de Ingreso Y Egreso de Armas a la Republica Argentina” (temporary authorisation to enter and leave Argentina with firearms), obtained at an embassy, or applying on arrival, with the relevant Police Authority, for an “Autorizacion Temporaria de Ingreso y Egreso de Armas a la Republica Argentina. – declared upon arrival. Fee: ARS 600.- (approx. USD 100.-) per firearm. WHAT ABOUT PAYMENT POLICIES ? A 50% deposit is required to reserve your requested hunt dates. The deposit is not refundable. Full payment is due 60 days in advance of your scheduled hunt. We recommend trip insurance, which we can provide. Please inquire for updated rates. 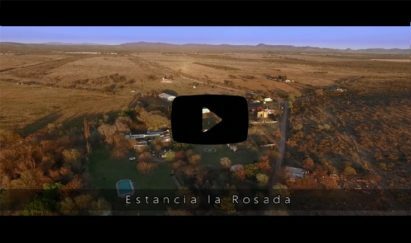 The acceptable methods of payment after arrival at La Rosada for shells, gun rental, hunting license, and pro shop items are cash or personal checks. A 2.5% surcharge will be applied US checks. These fees are what the local banks charge us; we regret any inconvenience. HOW IS THE WEATHER IN CORDOBA ? In spite of its latitude, the climate of the city of Cordoba, like that of the greater part of the province, is temperate moderated with the four well defined seasons. In general terms the climate is pampeano, of winters not very cold and little rain. Summers are wet, with hot days and cool nights. On the other hand, given the Mediterranean, the variations or thermal amplitudes are greater than in the Atlantic coast, being also smaller the annual precipitation, of about 800 mm / year. Its weighted average annual temperature throughout the 20th century was 18 ° C. In January, the warmest month of the austral summer, the maximum average is 31 ° C and the minimum of 17 ° C. In July, the coldest month, average temperatures are 19 ° C maximum and 4 ° C minimum. Even in winter, some rather warm days are frequent due to the influence of the Zonda wind. Exercise normal safety precautions in Argentina. Use common sense and look out for suspicious behaviour, as you would in your country. Avoid protests and demonstrations as they may become violent. If you’re in an area affected by unrest, follow the advice of local authorities. There is widespread transmission of Zika virus in the northern areas of Argentina. Pregnant women should discuss any travel plans with their doctor and defer non-essential travel to affected areas. While most major hotels in different cities exchange US currency, travellers cheques may not be accepted. Photo identification may be required when using a credit card. Keep a photocopy of the identity page of your passport with you if you intend to use a credit card in Argentina. Only use taxis that are clearly marked as ‘radio taxi’ with the taxi’s company name and telephone number visible. Radio taxis and ‘remises’ (chauffeured cars) can be booked by telephone or at the airport arrivals hall. Try to book taxis in advance rather than hailing from the street, and avoid sharing with strangers. The adventure is where you find in Argentina Dove Hunting. C&C Outfitters is where we make it happen. Whether you’re an experimented hunter or just a beginner is in our hands to give you a marvelous and gorgeous hunting trip.